Last year at this time the Marching Band was heading to state. So was the Soccer team. Our hometown newspaper had three articles about the Soccer team. including two colored above the fold pictures. They also visited the elementary schools for a pep rally in their honor...their are 4 elementary schools. I was really proud of the soccer team, because I believe when kids excel at their chosen activity it deserves to be celebrated. Especially in a day and age when too many just want to play video games or watch tv. With the obesity rate out of control active and fit kids that are willing to give up with evenings is an awesome thing. That's why I was beyond pissed that the band didn't get any mention. None. So I wrote a pretty hateful letter to the newspaper. I sent the same letter to the high school principal. What I received in response was both men blaming anyone they can think of. I saved all email exchanges so if need be I can prove that I am 100% correct in my saying that. This year it appears to be a repeat of the same. Although I can't speak for the newspaper because I have not wasted my money on that trash in a year. Wanna know the news in town? Log in to facebook. Its more accurate and more up to the minute. I received this text from the school. 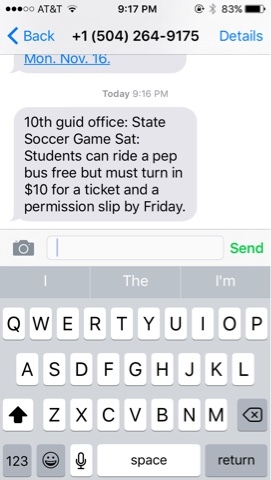 I really thought about calling the school to ask when the pep bus for the competition leaves, but I already know the answer. It will be something to the effect of. The band director didn't reserve a bus or extra hotel rooms for a spirit bus. But what the underlying reason really is. Our administration is bullies. All extra curricular activities are not treated equal. Some students will always receive special treatment. I didn't say anything the multiple times the band had to leave practice early (they have to practice on the parking lot) because the soccer team had a game and needed the parking lot. Although in retrospect I should have, because we are preparing for state also. Its disheartening that the lesson children take away from this is that they don't matter. Last year I mentioned to the principal that with school violence a real concern it seems to be that a competent administration would be aware of how they treat students. He tried to turn it around (of course gotta love the blame game). Abbey has been begging to be home-schooled. She's sick of it also. I can honestly say since my messages to him about fairness and school spirit equality went unheard I am considering it. At least learning at home she won't have to feel that she is lesser than anyone based on what activity she chooses. Can't we support all of our students? How hard is it to be excited and support all the kids? Hell I have friends whose kids are in nearly every activity offered. I love that we are varied. I love when I can brag at hour successful our school teams are doing. Why can't our administration do the same? Why do we allow our school leaders to be bullies?